GoldenEye is the first Bond I saw in the theatres and an iconic movie for many my age. Representative of the start of a new era for 007 (for better and for worse), it’s also fondly remembered as the basis for a legendary N64 game. The savvy pairing of songwriters Bono & The Edge (of U2) and singer Tina Turner yielded bombastic results with “GoldenEye”. It’s at once familiar but cutting edge (for the time), a showcase for Turner but also a little weird and ominous. The horns are there as is the wildly evocative and symbolic imagery in the opening credits. Classic and contemporary, “GoldenEye” does a fine job of ushering in the new Bond. The opening sees James storming a Soviet weapons facility by way of a spectacular bungie jump that hearkens back to some of Moore’s best stunts. Brosnan’s first words as Bond are “Beg your pardon, forgot to knock” as he knocks out a commie. He’s soon joined by Alec Travelyan, a.k.a. fellow MI6 agent 006, who is seemingly killed during the mission just as Bond makes a daring escape. That escape is probably the movie’s most outlandish scene, as Bond drives a motorcycle over a cliff edge to catch up to a falling plane. It’s okay in the context of the movie, but in hindsight serves as a warning toward the direction Brosnan’s films would take. 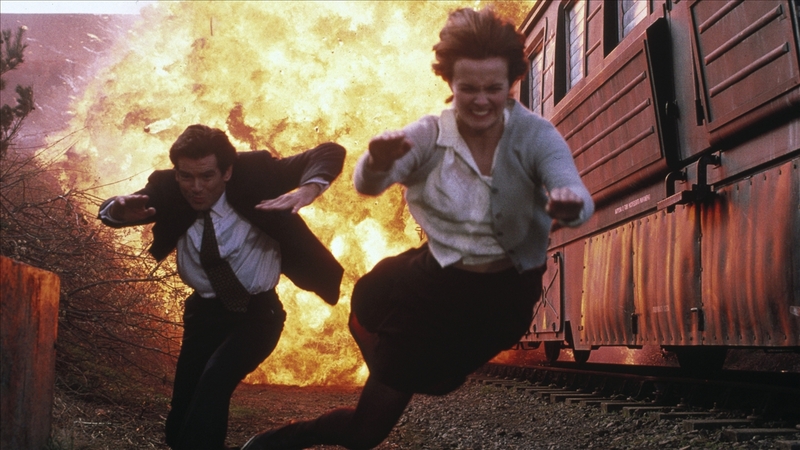 What’s a Bond movie without some ‘splosions? The plot picks up 9 years later and James is investigating the disappearance of a powerful new weapon – GoldenEye – that can arm Soviet satellites to send targeted EMP shockwaves. The trail leads to the shadowy Janus crime syndicate, headed by none other than a heavily scarred and embittered 006 who’s turned against Queen and country. Other notable foes include the well-coiffed Russian General Ouromov, the sadist Xenia Onatopp (more on her later), the Russian ganster Valentin (whose mistress is played is played by a very young Minnie Driver) and the inimitable evil hacker Boris (“I am eenvincible!”). The action scenes, of which there are many, are concise and cold in the Dalton tradition. Bond’s foes have a bad case of stormtrooper aim and couldn’t hit the broad side of the barn, while Bond always shoots to kill. No matter, as Brosnan brings a lithe physicality and cool demeanour to Bond that feels adept and able, even when he cracks one-liners. The best scene finds Bond commandeering a tank and causing gleeful mass destruction in the streets of St. Petersburg. GoldenEye‘s unique in that much of the first half takes place from computer programmer Natalya Simonova’s (Isabella Scorupco) point of view. She’s the sole survivor of a ruthless massacre at the remote facility that houses the GoldenEye weapon and she’s given lots of time to establish her character and elicit audience sympathy. The twist is that she’s a pacifist, although she still helps Bond reap vengeance. Scorupco is one of the better actresses to act opposite Bond and a welcome addition to the pantheon. The flip side of the coin is Xenia Onatopp (Famke Janssen), a femme fatale working for Janus who gets off on killing. Her preferred method? Death by thigh crushing (“Xenia – I can’t breathe!”). There’s also a new Moneypenny who’s far less docile (“As far as I can remember James, you’ve never had me”) and probably the most clever update of the Bond mythos, a female M (Judi Dench) who’s coldly calculating (“The evil queen of numbers”) and at odds with Bond. 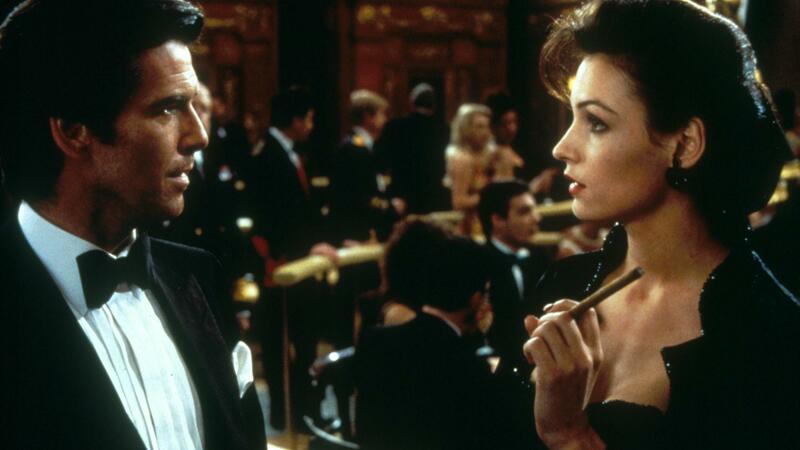 Brosnan slides into the role of James Bond with relative ease, feeling comfortable with the stunts and charismatic with the women (although GoldenEye stills feels somewhat chaste outside of Xenia’s scenes). 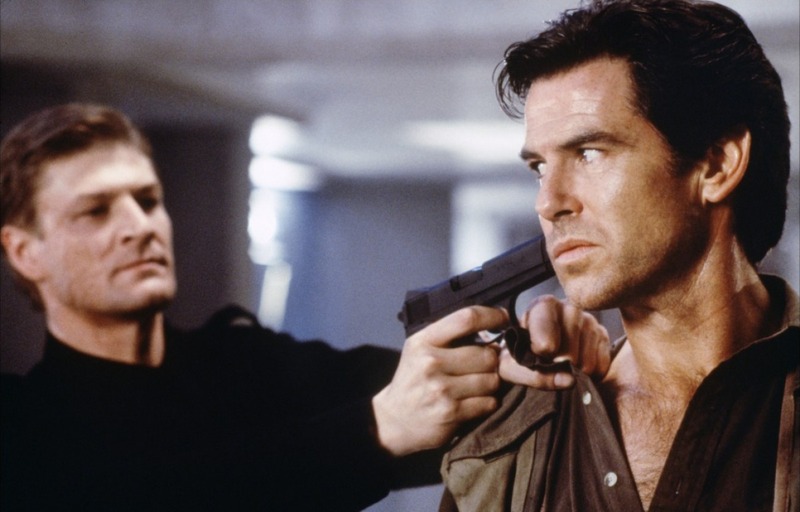 A remarkably strong first outing and one that features a murderer’s row of memorable characters, GoldenEye kicks off the Brosnan era in style. Outside of some good deconstruction of the character, GOLDENEYE is an unremarkable Bond film that stuffs every cliche of the series into a 90’s action package.The film pretends to be some bold new leap into the 90’s but at the end of day, Bond has to stop a super villain with an evil army in a secret underground lair who plans on detonating a cartoony space weapon. Brosnan himself is very robotic in the role and I can’t blame him because the script doesn’t allow him to do anything besides shoot things and run; there is almost no difference between him and the computer puppet you manipulate in the video game. The action is some of the most uncreative in the series which mostly consisted of characters simply running and shooting; Bond slaughters masses of faceless soldiers who don’t know how to shoot straight or realize that you don’t have to get within three feet if someone in order to use a gun. Lastly, the locations in this film make this one of the worst looking Bond films ever. The film spends so much time in computer rooms and military bases and rarely takes advantage of exploiting the natural background of the locales. There are just so many things wrong with this movie that it doesn’t shock me to hear that almost every fan of the film was a great admirer of the n64 game. There are far worse Bond films but no way GOLDENEYE deserves it’s reputation.